The second Westward Cup kicked off in style last night with a welcome reception held at the Royal Yacht Squadron in Cowes, Isle of Wight, which was attended by owners and participants of the Westward Cup 2012. Commodore Michael Campbell welcomed owners and their guests, and guests of the New York Yacht Club (NYYC) and the Yacht Club de Monaco (YCM), partners along with the Royal Yacht Squadron (RYS) who have teamed together to make this event possible and revive Big Class yacht racing in the waters of the Solent. Mr Zbynek Zak, owner of Eleonora and instigator of the event in 2010 to celebrate the 100th anniversary of the launch of the racing schooner Westward, tells me that he is proud to be back in Cowes and looking forward to a week of racing. 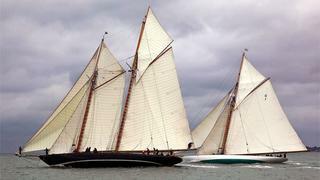 Taking up the gauntlet this year are three of the most famous and stunning classic yachts in the world who have covered miles to attend the event: Eleonora, Mariette and Mariquita, each with their owners and friends on board. The boats made a stunning sight off the Castle as they unleashed full sails in a northerly breeze of 14 to 16 knots. Looking elegant and completely at home in these waters, the three majestic beauties headed off to the western Solent with Mariette making a statement lead. The course of 30 miles took the fleet westwards along the Solent and back up to the east, close to the Bramble Bank, before heading west again and back to the finish line. As the race progressed Eleonora fell behind, with Mariette and Mariquita having a match race of their own. While both Mariette and Mariquita were racing with their full race crews, Eleonora was crewed by 20 young sailors between the ages of 18 and 23, novices who were invited by the RYS and NYYC to introduce new blood into the sport of classic racing. Mariquita took line honours finishing at 14.31.43, closely followed by Mariette 14.35.16 with Eleonora completing her first day’s racing in Cowes at 15.20.34.